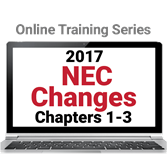 Be ready to apply major changes in the 2017 edition of the NEC® with online training you take right from your desk. Get up-to-speed with the significant changes to the 2017 edition of the National Electrical Code® with NFPA 70® Changes to the NEC 2017 Edition- Chapters 1-3. This high-impact online training course from the Code source helps you improve your ability to locate, interpret, and apply the latest requirements. Train from your desk, without travel costs or losing time on the job. The first online module provides an overview of the scope of the changes in the 2017 edition of the NEC, then you'll progress to major changes in Article 110: Requirements for Electrical Installations; Article 220: Branch-Circuit, Feeder, and Service Load Calculations; Article 240: Overcurrent Protection; Article 250: Grounding and Bonding; and much more. Each module includes interactive activities and a ten-question post assessment that helps ensure comprehension. Go online now and get started learning -- more modules in this dynamic series are coming soon! Complete this four-hour course and qualify for 0.4 CEUs. Upon successful completion of all five modules, participants will be prompted to download the CEU certificate directly from the course site.